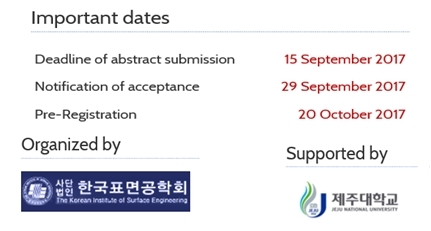 It is a great pleasure to invite you to the “1st International Symposium on “Surface Treatment & Modification Technologies” from 21st to 25th Nov., 2017 at Jeju National University, Jeju, South Korea. This symposium is for sharing new ideas, experiences and outstanding findings for surface scientists and engineers who are working on surface technologies for academic and industrial applications. This symposium includes all of chemical and physical processes to modify or to improve the surface properties of materials in liquid or gas environments. The surface technologies include electroplating, electroless plating, ion exchange plating, anodizing, plasma electrolytic oxidation, electrophoretic deposition, electrochemical polishing, chemical/electrochemical etching, Chemical milling, electrograining, chemical conversion coating, sol-gel coating, spin coating, Dip coating, painting, Pickling, Sputtering, Chemical vapor deposition(CVD), Plasma enhanced CVD (PECVD), Ion beam coating, High Velocity Oxygen Fuel (HVOF) coating, Plasma spray coating, Thermal spray coating, Pulsed laser deposition, Atomic layer deposition (ALD), Mechanical plating, Implantation, Carburizing, Nitriding, Boriding, Plasma etching, Peening, Laser ablation etc. This symposium also includes surface-related devices, such as Sensors, Solar cells, Fuel cells, Batteries, Biological applications, super capacitors, water purification, electrolyzer etc.